An amazing bathroom sink can be the ultimate complement to your bathroom décor. 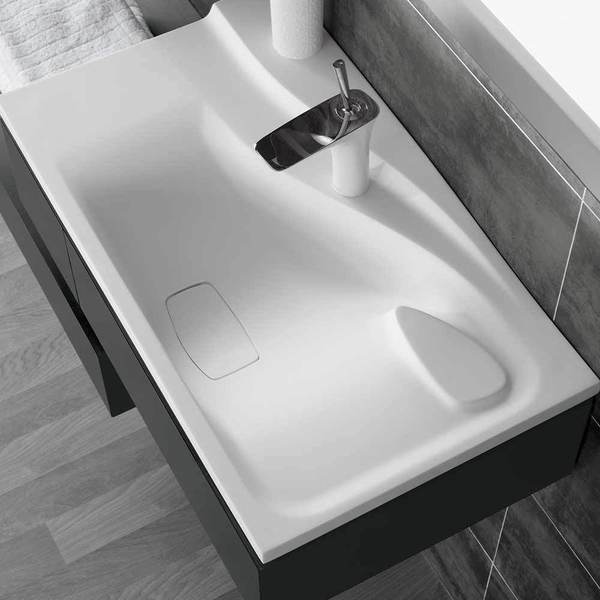 There is a world of bathroom sink options to explore, and Ronbow has a myriad of choices for you to consider. The Synthesis sink model above could define the whole look of your room. Even if you are choosing a standard vanity for your new bathroom, there are several choices of what type of sink to top it with. For example, a vanity sink can be a vessel, under mount, wall mounted or integrated with the countertop. When choosing a bathroom sink that is right for you and your family, there are some practical points to consider. Will your bathroom be used occasionally by guests, or will it be the main grooming area for three kids? While guests will enjoy a half bath with an innovative artistic sink, a bathroom for kids will be easier to keep clean under heavy use with an integrated sink top. 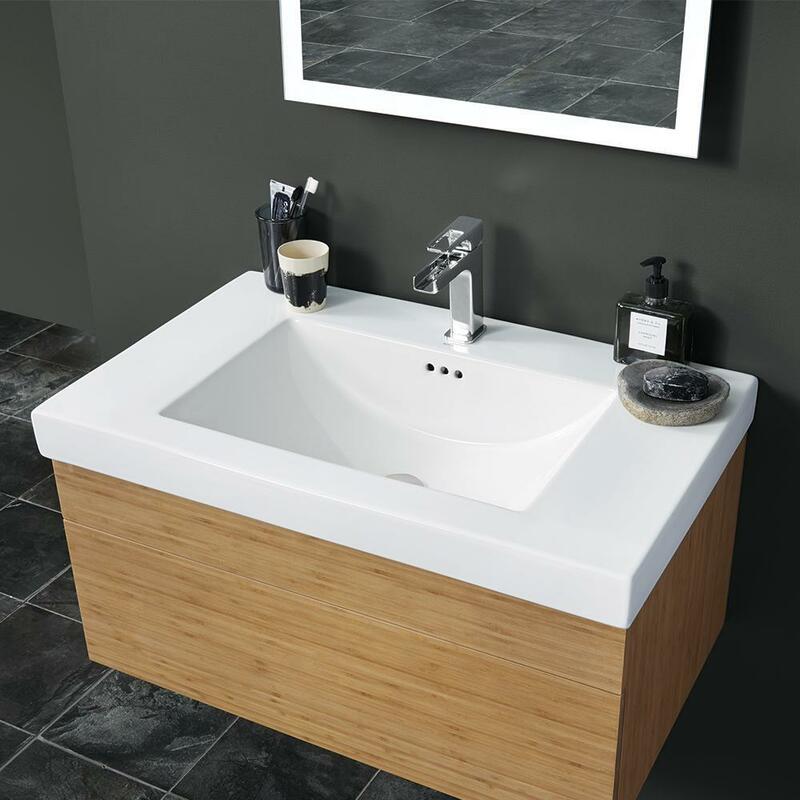 A vessel sink is a great choice for contemporary and transitional bathroom designs. Sitting on top of a sink cabinet, a vessel sink often contrasts with the countertop below it, like the Force model above. Because they are separate from their support, they are easy to mix and match with a wide variety of sink cabinets, wall mounted shelves and standard vanities. 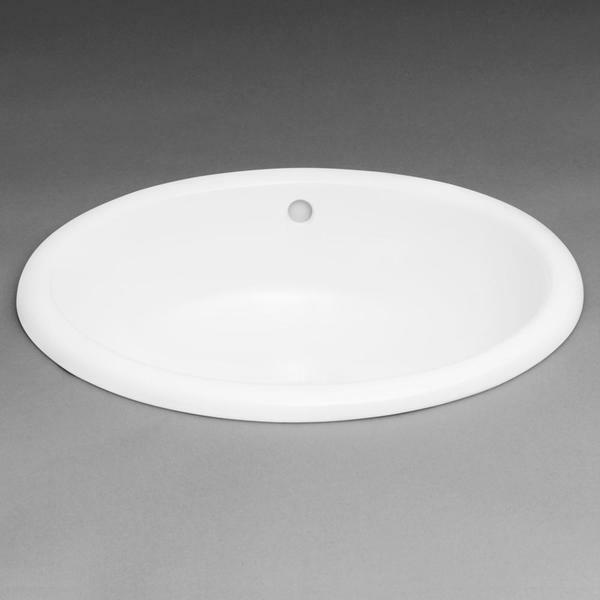 Gaining rapidly in popularity, vessel sinks come in circular, square, oval, rectangular, and amorphous shapes like the above bathroom sink. An under sink mount is more time-consuming in the installation process but is comparatively easier to clean because the countertop lays right on top of the basin lip so there is no seam around the sink bowl. This type of bathroom sink shown in the Essence model above, is also versatile like the vessel sink in terms of creating a custom look. You can choose to pair your under mount sink with the type of countertop material and vanity style that you want. An integrated sink top is a popular choice for a standard bathroom vanity sink. Because the sink and countertop are one unit, it creates a uniform look. This type of bathroom sink, shown in the Rebecca style above, is one of the easiest to keep clean and is known for being extremely durable. Wall mounted sinks are a great modern design choice and can help you conserve every bit of square footage when bathroom space is tight. 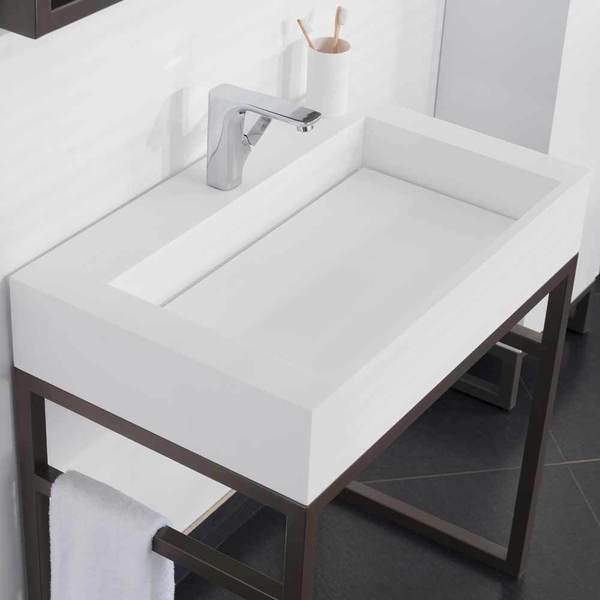 Minimal yet very functional, a wall mounted bathroom sink style, shown in the Marco model above, is emerging as a favored sink trend. How stylistically adventurous are you? 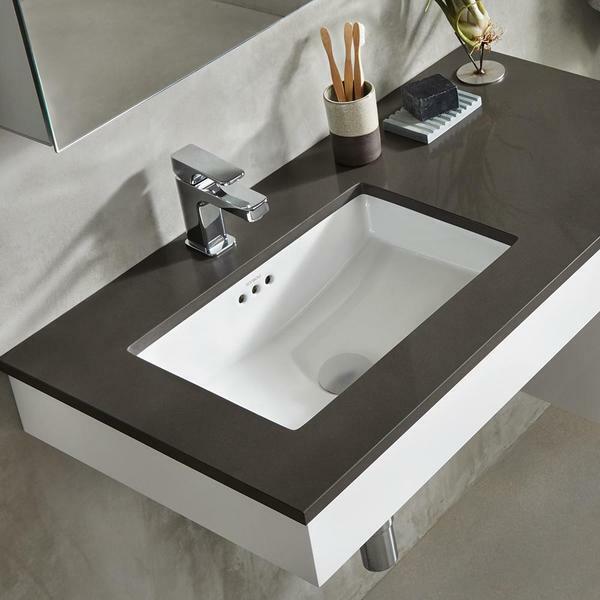 For those with a desire to go beyond the norm, bathroom sinks with fine design like the Vento sink above make great focal points and style statements. Innovative shaping and luxe treatments like ceramic drain covers take bathroom aesthetics to a whole new level. These type of creative sinks tend to work best with contemporary styled bathrooms. Sitting on top of a counter, drop-in sinks are easily installed, but they can get hard to clean where the base of the sink’s bowl lip makes contact with the countertop. This type of bathroom sink makes it easy for the sink color and materials to contrast with the countertop. Shown in the Cirque model above, its nod to vintage styling makes it an appropriate choice for a farmhouse sink style in the bathroom. For a master bathroom suite or for a bathroom shared by two or more kids, a trough style sink with two faucets is becoming popular to help meld the modern minimalist style with extra capacity. 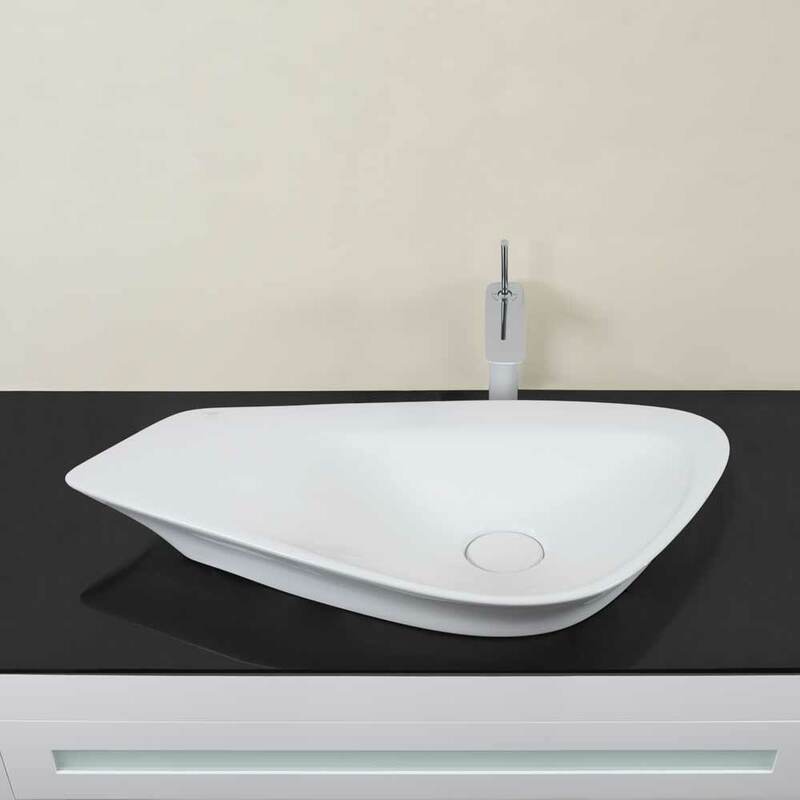 Curved basins are another detail that is gaining traction, along with ceramic drain covers in all types of sinks. Some design consumers are experimenting with different materials for their sinks such as hammered metal and glass. Bathroom sinks truly come in all shapes and sizes. For the best selection of quality sinks in every conceivable style, trust Ronbow to deliver beyond expectations.